The Most Comprehensive, Court Defensible, Low Light Training Program Available Anywhere! This PPSC course has been designed to meet the rising demand for more comprehensive training and specialization for armed professionals in the reduced light realm. It entails definitive information pertinent to human vision in low light environments, low light operational philosophy, equipment selection, practical live fire exercises, and interactive force-on-force scenarios. As the course progresses, the student will experience the gamut of reduced light training issues as well as acquire solutions and tactics for otherwise complex problems. In addition, long guns will receive much needed attention to address the operational concerns generally experienced with their use in reduced light. Night vision technology will also be addressed and used. This program was developed and is taught by PPSC Staff member, Tom Aveni. He was the first police trainer to offer an instructor-level low light course in 1995, and began teaching it internationally in 1998. He has certified hundreds of trainers as low light training instructors since that time. Tom has authored published articles on reduced light training concerns, as well as articles concerning officer shift-work concerns. As a result, his training has the depth and research that many other courses lack. How does this program differ from other low-light training courses? It was designed by a veteran police officer, police trainer and noted deadly force researcher. Course content includes material about human vision contributed by two PPSC staff eye doctors. Consequently, you'll know you're getting reliable visual data. This course is NOT military doctrine that has been slightly modified for police consumption. This course incorporates critical lessons learned from relevant case law regarding when "reckless" police tactics might undermine the objective reasonableness of an application of deadly force. This program has been taught domestically since 1995, and internationally since 1998. It stresses intuitive tactics and techniques that trainers can use to train their officers to use effectively in a matter of hours - NOT days! It has been designed to facilitate officer's working more intelligently under adverse light conditions. It affords officers the ability to use deadly force judiciously and effectively. It addresses patrol considerations that go well beyond the use of firearms and flashlights. Court-defensible scenario-based training is provided and then complimented by video-taped after-action critiques of all scenarios. Unlike many other low light training programs - this course does NOT embody any hidden marketing agenda. Yes, there are a limited number of products that we endorse, but this program wasn't engineered to sell you a particular brand of flashlights or lasers. As a result, you get the most unbiased analysis of ALL products available to you. Traditional police low light training is part of the problem - not part of the solution. This program represents a paradigm shift in thinking, and isn't a regurgitation of old, problematic doctrine. Consequently, this program will prepare agency instructional cadre to address a broad spectrum of compelling issues. 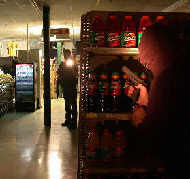 There is significant emphasis focused upon the need to provide techniques and tactics that officers can master quickly - given the fact that agencies allocate little time for low light training. The "SWAT-Ninja" breed of low-light training schools fail to address that harsh reality. Adverse light as a prevalent influence on policing. How criminal victimization patterns contribute to the frequency of lethal low-light encounters with police. Review of case law applicable to low light tactics and procedures and how they correlate with a "deliberate indifference to train." Operational philosophy and training issues. The nature of human vision pertinent to ambient lighting. Threat identification issues, and the troubling frequency of "mistake-of-fact" shootings that occur under low light conditions. Reduced light equipment selection and considerations. The extent to which current PPSC research is suggesting that night sights have failed to satisfy their intended purpose. The appropriate and efficient use of handgun mounted lasers and lights. Reduced light tactics and techniques. Handgun training in reduced light, with and without the use of flashlights. Force-on-force training that will provide operational insight and doctrinal validation of tactics. Video-taped critique of force-on-force scenarios, facilitated through the use of night vision-equipped digital cameras. Shoulder weapons familiarization, to include the rifle, carbine and shotgun, with and without the use of special light mounts, lasers, and other products. Introduction to night vision and electro-optical technologies. Investigatory issues and procedures pertinent to low light, officer-involved shootings. Agency training and qualification guidelines. Please Note: All applications, tuition or POs must be received prior to the beginning of class. Tuition includes a comprehensive classroom manual and all classroom materials. Tuition does NOT include the cost of the ammunition that each student will consume. 100% refund: permissible if course withdrawal is no less than 30 days of the starting date of the course you've enrolled in. 50% refund: is afforded if withdrawal is requested within 30 days of your course starting date, but not less than 7 days of that starting date. May be granted if the above stipulations are not met, but when emergency circumstances (i.e., professional or personal) might apply. These will be judged for merit on an individual basis.